Golden clay bakes gently in the warmth of the sun. Brilliant multi-hued shawls lend a dappled glow to the souk. She looks up and with the sun illuminating them from behind, the feathery bits of cloth are as vivid as stained glass. All around, the scent of exotic spices perfume the air as merchants wave their wares below the noses of promising customers. The gondolier’s throaty baritone fills the canal, bouncing off walls to return and join the chorus once more. High overhead, winged, stone lions keep close watch on the city. The stars peek over their shoulders to see what is going on in the city. The song ends and abruptly the canal widens onto a piazza. Revelers in rich costumes and delicate masks filled the streets. Lights festoon the plaza bathing everything in a glow so bright it seems the sun could not bear to turn its face away from this ancient city. 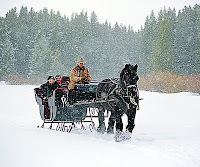 Sleigh bells carol out a merry greeting and the horses’ hooves send plumes of snow into the air. Fur lined lap rugs keep everyone toasty warm, except for noses turned cherry pink by the December chill and tongues held out to capture the first delicate snowflakes of the season. I didn’t take my first plane ride until I was seventeen, but I’d already been around the world many times. Books have an inherent magic to transport us. It can be to the neighborhood café, or to an entirely different universe. I know that there are any number of people who will only read stories with settings they are familiar with. I have a hard time relating to that mindset. Not that there is anything wrong with it! Everyone gets to do what they like with their own book budget. But I get more bang for my buck by being swept away somewhere I can’t get to in my everyday life.Books let us experience a world beyond ourselves, beyond our usual sphere. Part of the power in books comes from their ability to open the world to us. I’m a complete Anglophile because of The Little Princess, the Adventures of Sherlock Holmes and Agatha Christie mysteries. Once, on our way to an assignment in the Seychelles, I arranged for an extra stop at Heathrow airport because I’d read about it so often in various stories that it seemed like being a part of a larger story just by passing through that airport. (BTW, I don’t recommend it. Gatwick is a much nicer airport.) That brings me to my next point. Traveling via book is not nearly as much hassle. Don’t get me wrong, I love to travel, (we’re missionaries so it’s part of the job description,) but I could happily do without the inevitable annoyances, both major and minor. In a book you can explore without the inconvenience of competing tourists or a companion with a bladder the size of a peanut. The rhythms of a different way of life and the nuances of culture are laid open to us and we never even have to leave our sofas. What place means magic to you? Have you ever been there in ‘real’ life? What was the last book that transported you? Leave a comment with your e-mail address included (include spaces or brackets around the "@" sign so Net spiders, etc, can't phish your address) and we'll enter you in a drawing for a daily prize and also for one of the grand prizes. Great post, Lisa! My "magic" place has always been England--probably because growing up I read so many books set there! We finally got to make a trip in 2005, but it was way too short. There are still so many places left to explore in England and Scotland, both! I definitely think my love of reading infused my desire to travel. Lisa, what a great idea to take our theme and choose this practical version of travel. I agree with D'Ann that my reading has infused my love of travel and history. Recently I read Phillipa Gregory's The Constant Princess (actually I listened to it unabridged on audio), her story of Catherine of Aragon, the first wife of Henry VIII who was the daughter of Philip and Isabella of Spain. Ms. Gregory's description of the Alhambra, Catherine's home in the Muslim region of southern Spain made me really want to visit it. I swiped breakfast from Seekerville, so help yourselves! Sausage, biscuits, scrambled eggs, pecan coffee cake and of course some strong black coffee. Until recently I didn't realize that there are any number of people who will only read stories with settings they are familiar with. I have a hard time relating to that mindset, not that there is anything wrong with it. Everyone gets to do what they like with their own book budget. But I get more bang for my buck by being swept away somewhere I can’t get to in my everyday life. OOOH, we are on the same page, Lisa. Since I was a little girl, books have transported me to new worlds! I even have one of my great-aunt's 2nd grade primers that says, "Sailing to New Worlds" and used to stare at the colorful pictures and more colorful words! My magic place? IMPOSSIBLE to name one. The road to Hana, Maui. The treacherous bay between Maui and Molokai. Once-isolated San Juan Island, off the coast of Washington State. Grindlewald, Switzerland. Kilkee, County Clare, Ireland. Last book(s) that "carried me away?" ALL of the books I'm reading as research for Reclaiming Lily--set in China. Lord willing, I'll SEE the places in April!!!! Thanks for an exotic, thrilling post! Wonderful food for thought, Lisa. My current magic place, of course, would be Versailles where "Prisoner of Versailles" is set. I have not been able to travel there, but would very much love to do so. In addition to that, my husband and I traveled to Pennsylvania last year to visit the actual property where my ancestors, the Clavells, settled when they ended up here in the New World. That was magical to me to walk the same roads and see the beautiful farms where they homesteaded. The last book that carried me away was probably Siri Mitchell's "Constant Heart. Although I am a Regency writer, I haven't yet made it to Great Britain for one reason or another. I have, however, been to Europe, studied there in college and trips since. I used to be more of a francafile than an anglifile, read every book on the French Rev. I could find. So setting foot in Versailles, Notre Dame, walking down the Champs Elysee... Magic indeed. I loved Heidi as a child, so the Swiss Alps transported me with delight. But since I also love the sea and love America, I was wholly moved when I stood at Cabo da Roca, the western most point in Europe, where Columbus stood and said, "Dude, the world isn't flat..." or something to that affect. Or drinking from a fountain that's been carrying clear, mountain water into Cintra since it was Moorish. I loved Elizabeth Cadell books, as well as Jane Aiken Hodge, so Portugal was truly special. But right here in the US, I had the chance to experience a little foreign history when I sailed, including climbing the rigging, on the HMS Rose replica (now the Surprise from Mster and Commander). The original Rose was a British frigate sunk in the Savannah River in 1780. The last book that transported me far away? Sadly too few outside the US exist in the CBA, so it was probably a secular one. I know what you mean Golden. I went on a research trip to Williamsburg this past summer and even though I'd been there before I never fail to be awed at the thought of the people and the history that places can hold. I get goosebumps and do my best to absorb the spirit of a place, not just in what it looked like, but how it made me feel and what it made me think about. I guess that's something else books do for us. They takes us into new realms of thought. Laurie Alice have I told you lately how jealous I am of your HMS Rose adventure. What a grand experience. And I realized I haven't answered my own questions. Magical places to me: London, (yep, all of it), and Williamsburg. I have been blessed to go there. I'd also love to ride the Orient Express or visit Venice. Haven't managed either of those yet. The last book that transported me? The Swiss Courier by Tricia Goyer and Mike Yorkey. WWII Switzerland. Lisa, books and movies are my main mode of transportation, as my Friday post attests. The last book that took me away (actually while I was away on our cruise) was Water, Stone, Heart by Will North. A lovely tale of romance and self-discovery set in the charming Cornwall region of England. What a fun post, Lisa! I can wholeheartedly relate. Since I can't live in Great Britain (or at least spend a solid 3 months visiting everything I want for my stories), I greedily pore over my English-set books, magazines, etc. And sigh. That said, there is something amazing about visiting a place that has captured your imagination. I also enjoy US history, and we visited Gettysburg one sticky summer. Thanks to efforts to preserve the site, it was easy to imagine what it might have been like for the citizens and soldiers that hot July. I love this posting. And of course, being a storyteller, I have to tell a story. Like most writers, I've always loved books and reading. When I was in 8th grade, we had to write an autobiographical report, telling of all the places we had visited. I had a wonderful time telling of my journeys to China, Korea, Japan, Africa, India, South America, and many fascinating places in the U.S. As the teacher returned our graded papers, he asked me to stay after class. "Have you actually been to all of these places?" he said. "You're . . . so young." "Yes. Through books. I've read about those places. The writers took me to them." He smiled. "I see. You can keep your 'A'." There is magic in every place. One just has to look for it. You just might find it behind the next wild grape vine. Since my grandmother was born a Kelly, I've always longed to traipse around Ireland, filling my eyes and heart with a thousand greens, my ears with the trilling brogues. Thanks for your generosity and your lovely blog! Sharon, I love that story! So glad you got to keep your grade too, that was a teacher who understood the heart of a reader. Jeanette I can so relate. I've wanted to go to Ireland for as long as I can remember. I can sit and just look at pictures of that beautiful country for hours. I'm really enjoying all the comments today. So much fun to share the places we've "been"--real or through our imagination. Laurie Alice - My respect for Columbus just went up a notch. I like books about Africa, the Middle East and China. I've been to the Middle East several times. I also like tamer books about England, France and Italy. I've been to England and France so far. Forgot to mention. Real life traveling is a pain. Airplane seats in coach are designed for dwarves. I hate time changes too. And bad water. Books are indeed so much easier. Lovely post, Lisa. I felt the magic in each of your descriptions. I'll admit it, I'm one of those sad people who hasn't been many places and isn't really itching to change it. Other than various parts of the United States, I've only been two other places: Canada (for one whole day!) and spent a lovely long weekend in Puerto Rico, but only because it was my prize for being a Top Quality Service employee. Jen, you could hit both Busch Gardens amusement parks and feel like you traveled most of the globe that way. Great fun. England's my magical place and one of the reasons I write Regency Fiction. I studied in Oxford for a portion of my senior year of college. I studied the mysteries of Stonehenge, walked the cobblestone streets of York, visited countless cathedrals, and celebrated with friends at more than one Medieval Feast. What book has transported me? I'd have to say that Diana Gabaldon's Outlander series transported me like no other books I've ever read. Lisa, as I recall, he actually asked me to read the paper aloud to the class. As for where I'd love to go in person, there are many such places, but I would especially enjoy motoring around Scotland and Wales, my ancestors' homelands. Wouldn't I love to tell tales in a Scottish castle? 'Twould be magic. Some places that are magic to are New Orleans here in the US and England. I have been to Louisiana before but have not made it to England yet. The last book to transport me was The Potluck Club: Troubles Brewing. I love books with small town settings. Probably because i was born and raised in NYC. Catherine Palmer's, "A Kiss of Adventure," transported me to Timbuktu in Africa. I've never been there in real life. A funny story about books set in other countries. When I was a teen, I discovered all those lovely Mary Stewart books. I told my cousin, who had read to me incessantly when I was a child and she a teen babysitting me, about MS. She said she didn't like her. "Her books all take place in foreign countries." To which I said, "No they don't. The Ivy Tree is set in England." I was already such an Anglofile that I forgot that England was a foreign country. Nor is Canada to me. I grew up near the border and spent a great deal of time there. And venice? Got to get there before the sea reclaims it. So many good books set there. 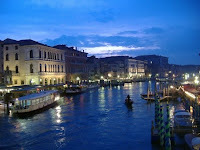 The Dark Palazzo by Virginia Coffman, One-Way to Venice, The Terracotta Palace... Take me back to my bookish teen years. Great post, Lisa. I didn't take my first plane trip until I was 43. So my traveling (other than living in Japan when I was little - and we went there on a ship) had been very limited up until then. So on that first plane trip, I went two places. Disneyland! My first time there, but I've been four more times since then. And Virginia. I was lucky enough to get there twice. And like you, one of my magic places is Williamsburg. I fell so madly in love with it. I would really like to take a two week trip for a writing retreat, and spend it in Williamsburg. Even if you don't write in the colonial era, which I don't, there is something so entrancing about it. It simply carries me away and I find it a very conducive atmosphere for writing. A book that really transported me was The Shape of Mercy by Susan Meissner. I was so totally swept up in both the story and the era. Susie, Williamsburg is only an hour from me. If you do your retreat, I'll come hang out. Laurie Alice what a great story, and I can so relate. I'm American by birth, but I think I'm English by cultural identity. Susie can more than one person come with you on your writer's trip? I have a great idea, why not have a writer's retreat for the Inkies and friends? I can dream anyway. My magic place is Russia. And I've never been there. Chances are good that I never will, but that just increases the magic. Last book that transported me was A Prisoner of Versailles. I recently discovered that I have French ancestors who may have been Huguenot, so Golden's books have taken on a new dimension for me. Dina and Lisa, YES! It would be so fun for all of us to go someplace like Williamsburg and have our own writer's retreat. I'm in! Rachel, I also discovered Huguenot ancestors. I haven't read Golden's books yet, but they are in my TBR pile.